A new book examines Gordon Parks’s transformation over the formative decade before his time as the first black staff photographer at Life magazine. A new book, “Gordon Parks: The New Tide, Early Work 1940-1950,” published by the National Gallery of Art, The Gordon Parks Foundation and Steidl, examines this transformation. It is timed to accompany the exhibit of the same name at the National Gallery from Nov. 4, 2018, to Feb. 18, 2019. The exhibit was curated by Philip Brookman, who is also the book’s author. The book features photographs that have never before been published, as well as additional essays by Sarah Lewis, Deborah Willis, Richard J. Powell and Maurice Berger, who writes the Race Stories column for Lens. Ms. Willis, who is a noted photographer, author and the chair of theDepartment of Photography and Imaging at the Tisch School of the Arts at New York University, knew Mr. Parks well. She spoke with James Estrin about Mr. Parks, and their conversation has been edited for brevity and clarity. The book and the exhibition cover Gordon’s work photographing for the Farm Security Administration, the Office of War Information and Standard Oil as well as his time in Chicago and St. Paul in the beginning of the ‘40s. It’s an incredible leap from 1940 to 1950. How do you think the 1940s shaped him as a photographer? I was really excited that Philip Brookman focused on the first 10 years. While writing that essay I had an opportunity to go back into some of the work I only knew peripherally, and what excited me was the Smart Woman magazine that he worked on as a photo editor. I started looking at the black middle class of Chicago that he photographed but no one knew about. He focused on fashion in Chicago, of course in St. Paul, but he was very active with the black press during that time, very interested in black migration from the South to the Midwest and the North. But he was focusing on who was living there and what opportunities black people had who were artistic, who had businesses, who were educated. It is a totally different realm than what he focused on in D.C. So that early part was crucial for my reintroduction to Gordon’s work. What I find extraordinary is his range and he did all of these different things during this period. And within different communities, Gordon was comfortable with knowing — and making different images about different communities. He understood what it meant to be an American in different forms and different ways. At the black newspaper that he worked at in St. Paul, he demanded a byline. He understood what it meant to have his name imprinted on the newspaper when he was making photographs of gorgeous ladies, college students, women who wanted to be models. He’s actually part of their dream. He’s documenting their dreaming of their lives outside of domestic work — opportunities that were broader. 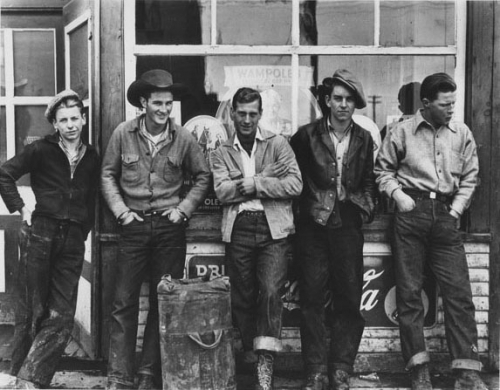 The photos he made for Standard Oil are mostly of white people working. But if you look at the family scenes over dinner you see the composure that he must have had to make them as comfortable as they were. I believe that he was able to make people feel at ease. You know, he was just a good soul. I was studying photography at Philadelphia College of Art, and there were no black photographers in the history books. I was working on a paper for one of my teachers and asked, where are the black photographers? So how would you describe him? Generous. One word, generous. He listened closely. He understood what I needed, and he offered support. He loved his work. And like he said, he did not get up early. You could not visit him before 2 p.m. He was a neat, meticulous man in terms of his style of dress. He understood that he had a legacy. And the fact that his photographs were organized, the fact that he knew he wanted his collection to be preserved and his story told by him and by others. Absence. The absence of the stories that he probably missed when he looked at the magazines while he worked on the railroad in the 1930s. He understood the silence of African-American history in terms of the larger story. And he was determined to make sure that his story was told, and the breadth of his story was told from multiple perspectives, from a boy growing up in the Midwest, to someone who had a dream about being a photographer. His life was complex. And it was not one-dimensional, as most people think when they see someone who is black and poor in that time period. This was a time when the World’s Fair was in Chicago in 1939 and he was traveling back and forth with a young family. Those experiences probably left an impact on him, especially when he started going to the Art Institute to look at art and tried to place himself within that framework of art making and art creating. His life has been widely examined — by himself in three memoirs, and in the last few years by many other people. Is there something that you think is not often considered but is pivotal in understanding him? I found that he was always looking at beauty. Not in terms of sentimental beauty. But understanding beauty in life, beauty in living. And I think that that’s something that he was in search of in all of his photographs, about life and beauty in that simple sense. And that’s something that people don’t talk about often. That’s interesting, and it goes beyond fashion. Yes, beyond fashion. It’s a kind of inner turmoil of how we appreciate life and how do we give back. When I look at his photographs I see Gordon as a generous person. I see that exchange that happens when he’s in an environment of that family at a table or with the cowboys outside of the store. He’s not allowing barriers to stop him. He’s completely there. But what really fascinated me is that they were so cool with him. You can see it in the photo. I just want to sit at that table and listen to what they are talking about. It’s obviously part of his gift. And that’s a relaxed gift. It’s not forced. A kind of a way of reading — understanding humanity. He understood humanity. I still feel like he’s with us in a sense. I’m so happy that he made the decision to create the foundation, and understood that his photographs would open up a whole new reading of photography to another generation of photographers. What was the relationship between him and Langston Hughes? He was in the environment of all the Harlem writers and he worked closely with Langston when Langston moved to Chicago to present his “Shakespeare in Harlem” play. They met in rehearsal time and they made photographs while he was in Chicago. They had a strong bond and a real playful relationship. Gordon was also close to Richard Wright and Ralph Ellison. And I can see his deep involvement, not just as someone who took the pictures but someone who is part of that. And you see that sense of theatricality in his work. The way that Gordon created the narrative for the “Invisible Man” photos — not only the manhole cover but the underground scene with the light bulbs. He’s reading deeply into the text. He understood props as well. That’s why he could easily move right into making films. Is there anything else that you think is key to understanding him, both as a photographer and as a man? Well, he understood that his images mattered. That’s why he wanted the byline. And I think that he agreed to make a radical difference looking at black lives in Chicago or in St. Paul. He understood what mattered. And most people don’t. They think in the moment, but he’s thinking beyond that.